Although I live in Michigan I did not grow up here. I did, in fact, grow up in the garden state (New Jersey). While the state gets a bad rap due to it’s proximity to New York city and the urban sprawl and development that has left almost the entire state a suburb of NYC most would be surprised that, forty yeas ago, most of the state was considered rural. It was during this time that my Father bought our house in Montvale, New Jersey. In the woods sandwiched between 2 apple orchards we watched as our house was built. The only businesses for several miles were an antiquated gas station, a diner and a Dairy Queen (still there today in it’s original building). When we finally moved in it was the culmination of my fathers dream. For a guy that grew up in the city my father now had a house in the country. We always had a garden. We grew corn,cucumber,watermelon etc.. in addition to the apples we picked in the neighboring orchards. I don’t recall exactly how but my father also found a rather large Blackberry patch in the woods. 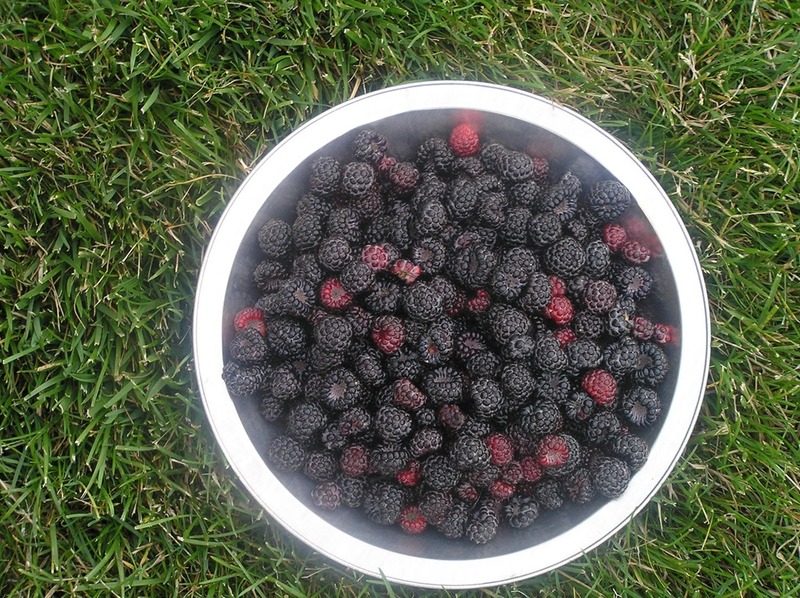 Each summer he would put on his berry picking clothes (thick denim jacket and a straw hat) and go off into the woods only to return several hours hours later bringing several quarts of big,fat and perfectly ripe berries. When I got older I would join my Father on theses expeditions. We would eat them with fresh cream and sugar. What we didn’t eat we would set out by the road on a table to share with the neighbors. The woods and orchards of my youth are all gone now, victims of alleged progress. The land became more valuable for corporate headquarters and urban subdivisions but the memories are still vivid to me. A couple of years ago I discovered a wild black berry bush growing in my back yard here in Detroit, courtesy of the birds I suspect. It was a welcome addition to the wild herbs that also grow here at the house. This year I found myself with a bumper crop of berries and picked then diligently each day or two until the crop ran out. To my surprise I ended up with about a gallon bag of berries. I decided to use this years crop to make blackberry jelly. Nothing could be more simple to make than fruit syrup. Jam and Jelly are equally achievable. Some of the important points I can bring to light are to make sure everything is sterile. This just means boiling your jars,utensils etc…. 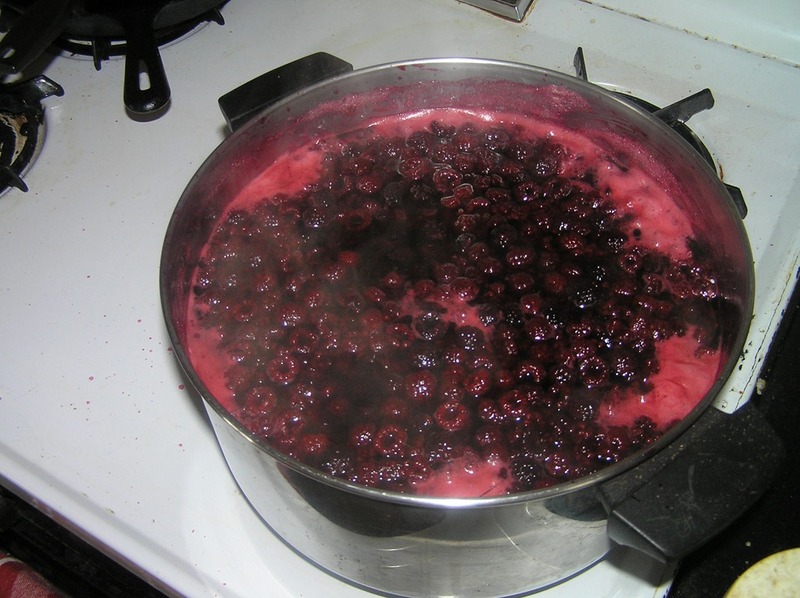 Another is to strain (through cheesecloth) the solids and seeds that are especially prevalent in wild berries. Strain twice if you need to!! I’m including a basic recipe here but with just the basic ingredients ( berries, sugar, water, a little lemon juice and pectin) I was able to make 7 1/2 pint jars of jelly. Stirring constantly, bring to a rolling boil and boil 1 minute (a rolling boil can not be stirred down). Remove from heat. Strain though cheese cloth and a fine sieve. Wisk in pectin and lemon juice. Skim off bubbles. Ladle jelly into hot, sterilized containers, one at a time. Fill to within 1/8 inch of top. Wipe rim of jar or glass with a clean damp cloth. Refrigerate until ready to use. Jelly should keep for a couple of months. Never EVER double a jelly or jam recipe. For some reason, this effects the setting. 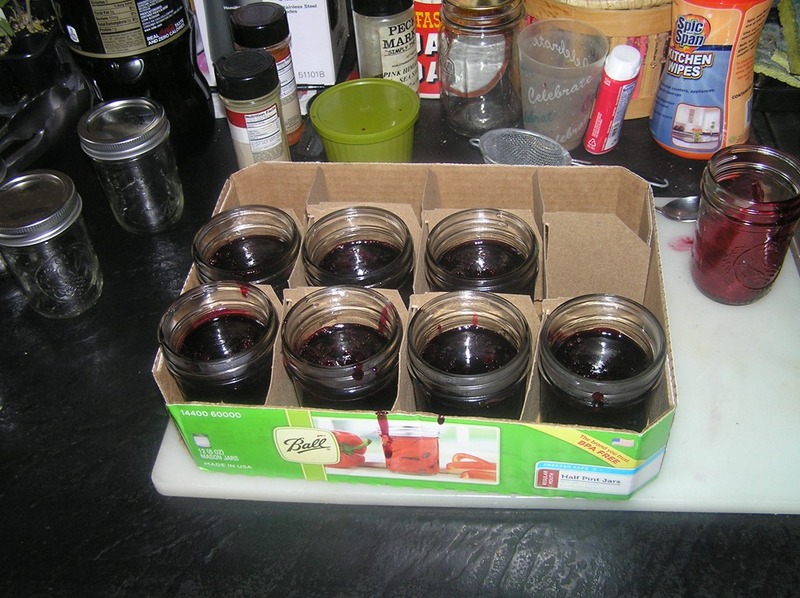 If your jam does not set, chances are it contains too little pectin. An imbalance between the pectin and the acid in your jelly. Adding a little lemon juice helps the pectin, and also helps create an environment hostile to bacteria. High humidity in the kitchen can cause problems with jam and jelly. Finally, you can defeat the whole purpose of adding pectin if you boil the mixture too long — overcooking causes the pectin to break down and lose its thickening capacity. This is a refrigerate jelly and not a preserve. It needs to be refrigerated.I am not using canning techniques in this recipe!